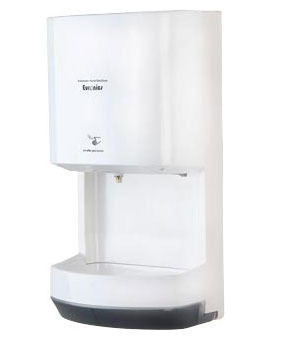 Providing you the best range of EST01 Auto Hand Sanitizer Dispenser, EST02 Auto Hand Sanitizer Dispenser, ES08A, Automatic Soap Dispenser, ES06A, Automatic Soap Dispenser, Kinox KSD2A, Automatic Under Counter Soap Dispenser and ES 09, Soap Dispenser with effective & timely delivery. EST1 Hand Sanitizer Dispenser Disinfector kills 99.99% of most common germs, HINI Virus & Flu Virus that may make you sick. Container - 18-8 S, type-304, 22-gauge (0.8mm) stainless steel with satin-finish. Body is drawn, one-piece, seamless construction. Back plate has mounting bracket attached. Furnished with concealed wall plate. Equipped with a clear acrylic refill-indicator window and a locked, hinged stainless steel lid for top filling. Dispenser hole diameter - 1" - 1-1/8"
Piston, Spout, and Top Cover - Type-304 stainless steel with bright polished finish. Body and Shank - High-impact-resistant steel. Valve - Steel cylinder. Stainless steel spring. U-packing seal and duckbills. Container - Translucent, shatter-resistant polyethylene. Valve - Brass push button and back cylinder. Stainless steel spring. Construction: 18-8 S, type-304, 18-gauge (1.0 mm) stainless steel with satin-finish. Behind Mirror Infrared Soap Dispenser for contemporary washroom design with an uncluttered appearance designed to be fitted behind hinged mirror or panel (Access required to replenish soap supply). Touch Free thus eliminating cross- contamination. Helps prevent vandalism vandal resistant powered by 9v transformer. Chrome plated nozzle designed to protrude slightly below bottom edge of mirror making it quick easy to identify use.